Stay at the Rosalie Bay Resort in Dominica and, depending on the season, you might come away with photos that are beyond the usual postcard-perfect pics that we all take when we vacation at a Caribbean locale. This eco resort is at the center stage of the life cycle of several species of endangered sea turtles. 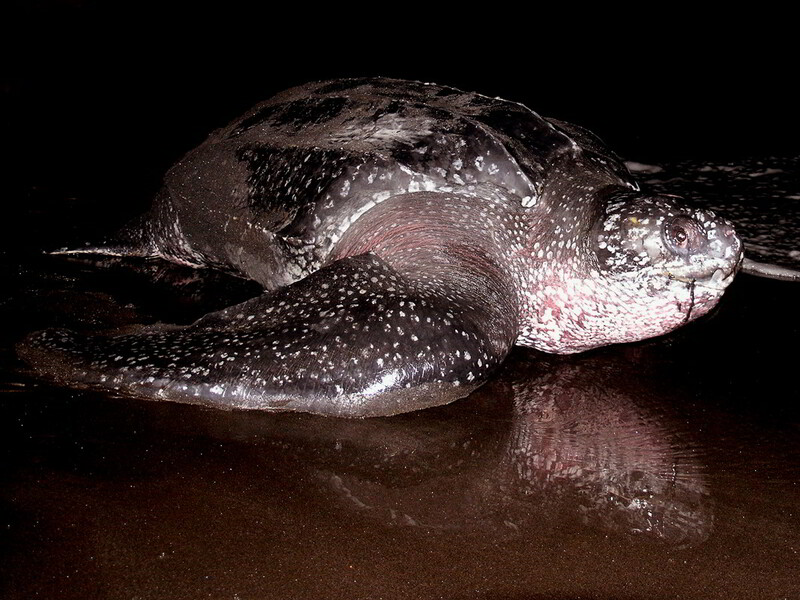 Green, hawksbill and leatherback turtles each creep across the black sands to dig a wide pit and then a deep chamber to deposit dozens of eggs. Visitors can request a wake-up call -- no matter the hour of the night -- to experience this memorable event. I recently wrote about my leatherback nesting experience for National Geographic Traveler - Intelligent Travel. It probably was the only time I was delighted to receive a phone call in the middle of the night. Nice and useful information. I had never heard about these things before. Thanks for sharing such a nice information with us. Hey, You have shared very beautiful and real pictures. Thanks for sharing. Sea turtles are magical. We swam near some in Hawaii and they are amazing. I have seen their nests roped off in Florida as well. What a wonderful experience to see the eggs being laid. Very, very cool. I've always wanted to see sea turtles in the wild. Hi Brette, I've never seen these turtles in Hawaii. That sound so cool that you were able to swim near them. Hi Melanie, So many times I find beaches where I'm told sea turtles nest but, up until this time, I've never been able to see them in action. How wonderful. Hi Cheap Car, Glad you enjoyed the images. And thanks for stopping by. What a glorious site to see - what an amazing trip. I so love sea turtles. This sounds like a once-in-a-lifetime experience. Hi merr, Yes, this is a super special place, especially because you can see the turtles nesting just by walking two minutes from your hotel room. It's great to see a resort that's so eco-conscious. Hi Heather, I certainly feel very lucky that I was there at the right time. I was so worried that I might've spent a week here and never see them. Very cool! Turtles are so neanderthal looking. Hi Jane, I totally agree. It was magical standing beside this ancient species. Hi Steph, I've also only seen roped off areas before this time. And found it so frustrating to never get to see 'em. This must be amazing to see up front and in person. Fabulous that guests can actually request a wakeup call to see this! Hi Sheryl, What I found surprising is how few guests requested the wakeup call. On that night, I was the only guest to show up!